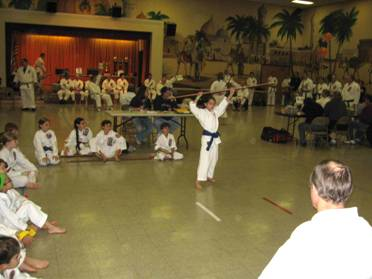 We teach beginning, intermediate, and advanced weapon katas (forms) in our dojo. 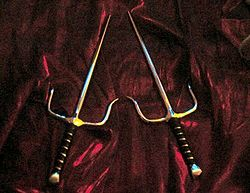 Kobudo (Tegua) is an Okinawan term that refers to Kobujutsu, or ancient weapon art. When the Japanese controlled Okinawa in the 1600s, no weapons were permitted. This was done to keep control of the people. The Okinawan people began to look at their farm implements as something they might be able to use to defend themselves. 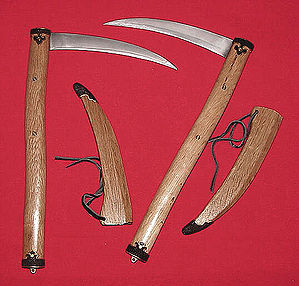 With practice and determination the tonfa was developed from millstone handles, the kama was developed from sickles, the bo was developed from a 6 foot staff used to carry parcels, the sai was developed from a furrowing and planting tool, and the Nunchaku was developed from an implement used to flail rice.